Last week, I received a curious email through my website. I don’t know the person who sent this and I didn’t reply. I’m not a scammer and I’m careful to avoid clients who are eager to scam people and generally engage in malfeasance. I can spot these reprobates and blacguards a mile away. But I understand why people think that direct marketing is a scam. There are lots of scammers in direct marketing and lots of scammers who use direct marketing techniques to sell their products and services. Every single one of my clients offers a guarantee. And they stand behind it. Nobody forces my readers to try the products I’m selling. I never write hype and I never lie about a product or service. There’s no ‘bait and switch’ and nothing stupid or hidden. My style is clear and straightforward and I don't write the type of "hyperventilating" guff that some copywriters, some of them well respected, think is mandatory. I write golf copy and there's a famous, or infamous, golf ad from several years ago. Something about a golfer with one arm hitting the ball a million miles. No. This direct response copywriter doesn't make absurd claims just to get someone's attention. I don't need to. There’s no need to lie or obfuscate. The people who read the copy have a need for the product or service I’m writing about. The product or service helps the readers get where they want to get. Only amateurs and really bad copywriters rely on telling lies and/or absurd hyperbole. Fact is, you’ll find scamming and scammers in every industry. Yes, you’ll find them in direct marketing. But if you’re a direct response copywriter, you can avoid the scammers. I understand why people are skeptical about direct marketing. Just look at your email. And there are several direct response copywriters who are happy to push well beyond the boundary. What’s worse is that several people in direct marketing put these copywriters on a pedestal. I find this to be inexcusable. Now … I work hard to put the truth and the product or service in the best possible light. Why would I not? But that’s NOT lying and it’s not scamming. And once again, I make it totally clear you’ll get your money back if you don’t like what you bought. But if you want to see an example of scamming in direct response copywriting, look no further than copywriter groups on Facebook. There are quite a few of them. I was in one for a few months and I just left. It’s a so-called “private” group with almost 20,000 people. Not exactly private. Join and you’ll get general advice about writing copy from other copywriters. Plus there are people who need copy who will post jobs. Advice plus opportunities to meet people willing to pay copywriters for copy. Sounds good, right? What could be wrong? So … why did I leave? The other day, I saw a post by someone who wanted a full-on AR series outlined for … FIFTY DOLLARS. Writing that series would take about two days of work. I would charge a lot more than $50 for my time and expertise. So would you. The moderator of the group said he had to delete over 50 “snarky” comments about the fee and the person who wanted the AR series. Is that censorship? We could have a long debate about that. I’d tell you it is. But here’s the point. The person who wants the AR series for $50 is a scammer. Or stupid. Or both. And the person who organizes the “private” Facebook group is a scammer. He’s happy to organize, to help himself in some way, a group where really bad clients (and yes, they’re ALL really bad) can try to scam copywriters by offering really bad terms, really bad pay, and really bad products. Complaints? Don’t try to complain in that group … and all the similar groups. But the organizer/moderator is only a scammer if you let him/her be. If you’re relying on a Facebook group to find clients, then stop immediately. And when it comes to finding clients, I’ve said it many times before. The best way to find clients is to target who you want to work with/for and let them know you can help them … and prove it. OK ... I fully admit to some venting here. There are so many great people in direct marketing and I hate it when a few genuinely awful people give direct marketing a bad name. Oh well ... I'll keep moving on, NOT being a scammer. I run into a lot of people in/from the business world. I meet people with business degrees. I meet successful entrepreneurs. I meet business academics. Pretty much the whole shebang. Many of these people want to know what I do. And then I get a blank stare or a few moments of embarrassing silence … even from people in business. Quite a few people think I’m some type of lawyer, specializing in the realm of intellectual property, specifically the little ‘c’ sign. Even though I’m in the writing business and words are my day-to-day existence, I’ve never really come up with a quick and simple definition of what a direct response copywriter really does. Here are just a few of my efforts. *It’s sort of like those infomercials. I’m a salesman in print. The problem with the last explanation is this … it makes me seem a tad low-end. That’s not how I operate. I’m not trying to fool or con anyone. I’ll leave that to the bankers from a certain national bank. Let me make it much, much easier for everyone. The people who know what a direct response copywriter does … and hire a good one … make a TON of money. One of my clients has organized sales in excess of $400 million for their products. A major international company purchased another client for tens of millions. The copy is part of the equation. 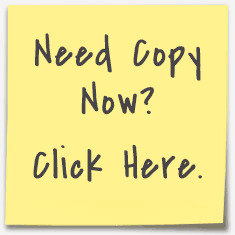 Certain people in advertising and marketing fully understand my work and how I write copy. But they won’t hire me or another direct response copywriter because they’re worried about “brand equity” and other such nonsense. Oh well … that’s your loss as the money leaves for your competition. How many direct response copywriters are there in the world? About 200-300 who can genuinely motivate potential customers to become actual customers. This explains, in part, why so many people in business don’t know what I do. I’ll write it one more time. I love direct marketing and direct response copywriting for many reasons. One of them … I never hear excuses from serious direct marketers. When sales are lower than usual, direct marketers find a way to increase revenue. So you can imagine my SHOCK when I recently received an email blaming a lack of sales this year on something that happend LAST YEAR. I thought I had seen and heard pretty much everything in the world of marketing but that’s a first. Let me say that again … sales are down this year due to conditions last year. If I were the CEO or owner of that company and I saw something like that coming from the marketing department, two things would happen. First, the head of marketing would be given a straight red. Then I’d find a direct marketer who could actually generate sales and revenue whatever is happening. The direct marketers I admire are the ones who get the job done whatever is happening in the economy and the world. Imagine what would happen if I wrote some direct response copy and it failed and I blamed conditions last year … or ANY year. The client would go totally berserk … and with good reason. If things aren’t going well revenue-wise then direct marketers dig deep and find that revenue. Let’s change the subject before I implode. I belong to a number of groups on Facebook and Linked In. I can’t say that I spend a great deal of time participating. Here’s one reason … I see a TON of awful advice and information in these groups. A few months ago, I criticized a person for providing information I know is blatantly wrong. I received a fast response from the person who leads that group saying I was wrong and she was right. I won’t go further into the exact details. I stopped right there with the conversation because I have better things to do than get into online arguments. I'm a busy direct response copywriter. Don’t listen to people in those groups. Base what you do on advice from people who actually know what they’re talking about. There’s one problem here … these direct response copywriters don’t hang around in Facebook and Liked In groups. Don’t make excuses. Be careful who you follow and believe.